Wild Pines Park prides itself on providing unique, memorable experiences in a professional and safe environment. Our carefully chosen instructors will be with you throughout your day. We offer ropes courses, team building activities, meeting rooms, food and more. Why not bring your company or team here and experience everything we have to offer. Firstly no two team building days are the same so we tailor each day to your specific needs and goals. I'll outline our basic options and let you have a think about what you would like to go for. We do a simple ropes course experience (up to 20 people), this lasts 2 hours. The course has 6 zip wires and 29 further challenges, great for fun, bonding and challenging yourself. If your group wishes to challenge themselves then try out our challenge course with the 100m zip wire. We also have archery available that we can combine with the ropes course, bring your own lunch and we make it a day of fun stuff! (up to 40 people). This is what we often do with small company groups, schools, colleges and youth groups. A typical day starts at 10am, with a briefing for the whole group. Timings are dependant on the size of your group as a day for 8 people is different to a day for 60 people. With 60 people (for example) we split the group into four. 15 in each group with each activity lasting 90 minutes and then rotate to the next activity. We have lunch at 1pm then start again at 2pm finishing at 5pm. Hog roast with all the trimmings (£22pp). 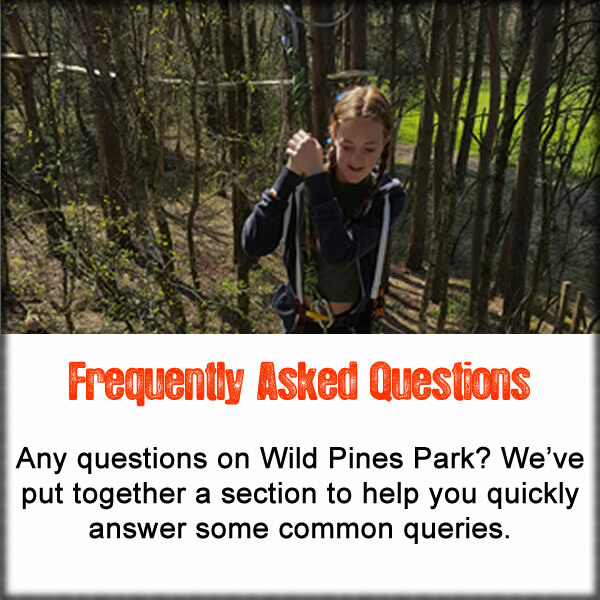 Please contact us on office@wildpinespark.com or 01673 842724 for more details and to book your amazing team building day.